There is an entire world out there, waiting to question, to learn, to absorb, to understand. In this online world, oftentimes, voices get muted or diluted thanks to the mass amounts of content being pumped out every nanosecond. However, for me, on March 12, I was able to touch the minds of many, thanks to hosting an Ask Me Anything session on Reddit.com. For two hours, I answered questions sent to me from users all over the world. Most wanted to know one thing: what was it like to survive the Holocaust? And, what can I do now to help ensure these atrocities are never committed again? The conversation was touching. Inspiring. It filled me with such happiness as there was genuine curiosity. These people. In a world where information is thrown at them without a second thought, wanted to learn and to let me know they are there, supporting survivors, supporting our efforts. During the AMA, I shared my story of surviving the Holocaust and being liberated. I also recounted the events which led me to meet my liberators at an event later in life. The comments people made touched me, and the conversation was uplifting and inspiring. To see these strangers come together to support me touched me incredibly. It was further proof for me to solidify my goal of making “I-SHOUT-OUT” an international campaign, touching the lives of millions. The people who participated in the AMA conversation with me echo my desires – to speak out against intolerance, injustice, racism and bullying. To send a message to the world that no one should be a bystander, that voices can be heard, and people are ready to change to make the world a better place. “Your story of being separated from your family is probably the most profoundly heart-wrenching thing I’ve read. Words cannot express how sorry I am that you and so many others like you had to experience something so horrifying. Yet, your story…your life is inspirational. The fact that you found happiness in your family, your “new life” is wonderful. There were so many more comments from participants that touched me, which brought tears to my eyes, and which reminded me of the good in people. 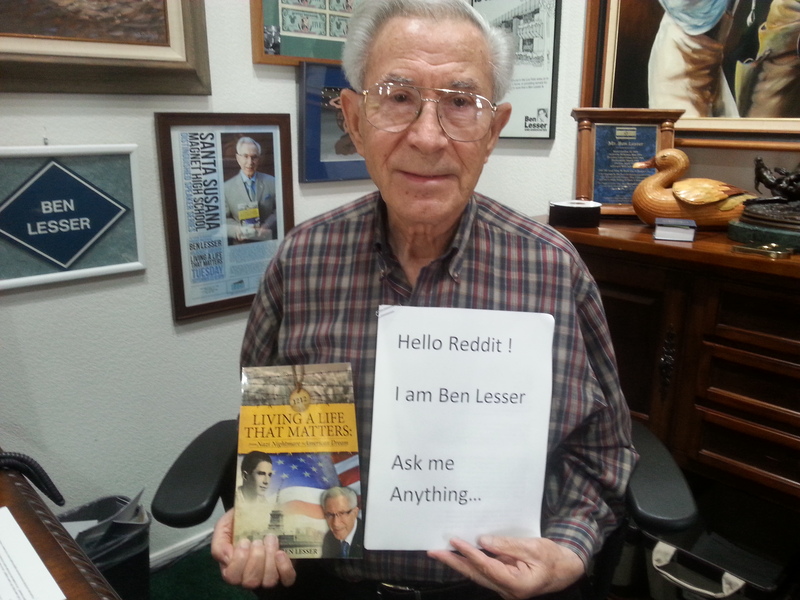 If you weren’t able to participate but want to read and comment now, visit the I Am Ben Lesser AMA Reddit thread. Once again. Thank you for listening. Because as listeners you bear witness to tell the stories long after I could. And thank you Reddit for allowing me to share my story. To read more of my Reddit session, visit I Am Ben Lesser AMA Reddit thread. And don’t forget to SHOUT-OUT for what you believe in TODAY: www.i-shout-out.org. To learn more about Ben Lesser, please visit www.zachorfoundation.org.